Whether it’s due to storms, falling trees, or other problems, power outages always seem to happen at the very worst possible moments. This is also why homeowners who prefer to be prepared might consider buying a home backup generator. Imagine: Your lights, stove, and all-important iPhones stay charged until your ordeal is done! But here’s the problem: According to Consumer Reports, sales of backup generators “spike around major storms—just before and a few weeks after—which means that too many buyers shop when the power’s out, randomly choosing a generator that looks up to the task, and then have no idea what to do with it when they get it home. If you don’t want to be one of these bumbling generator buyers, it pays to read up on your options before disaster strikes. So how about right now? Here’s the scoop from generator expert Keith Pinkerton of Mr. Electric, a national franchise provider of electricians and repair services. How much wattage do you need? This wattage calculator is a great way to figure out how much power you’re going to need. For instance, each lightbulb will require 100 watts of power, your microwave oven 450 watts, a laptop 25 watts. How often will you use the generator? If you’re in an area where power outages happen only once in a blue moon, then a cheaper rainy-day model is probably fine. How much do you want to spend? Reliability has a price. The more you spend, the more comfortable you’ll be during a power outage. Portable generators are akin to really big lawn mowers: loud, smelly, and dirty, but extremely necessary. They serve as a cheap insurance policy if your home goes dark only once every few years. To be up to code and ensure you’re not potentially endangering power workers, you should run the generator into a power transfer switch. This also lets you power things like overhead lights, heaters, air conditioners, and other things that don’t run on a plug. But watch out: For safety reasons, it’s very important to keep portable generators running at least 10 feet away from your home so that you don’t run the risk of carbon monoxide poisoning. Got that? These generators, roughly the size of a garage-size freezer, are designed to keep your house fully powered for days in the event of serious (or frequent, smaller) power outages. 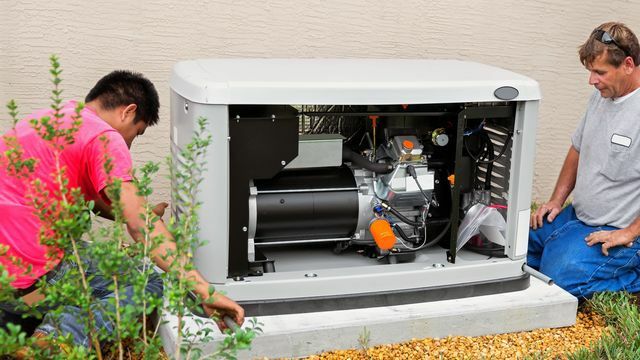 Stationary generators must be professionally installed by a contractor, usually on a permanent pad near your home. They can run on a variety of fuel options, including propane and diesel, or even be hooked up to the municipal gas lines—that way, they run cleaner and don’t emit the carbon monoxide fumes of portable generators. Even better, these units can be wired into your electrical system to automatically switch on when the grid loses power and automatically transfer back when the power comes on. All in all, if you lose power frequently, work from home on tight deadlines, and/or have computer systems or medical equipment that are critical to run, a stationary generator guarantees a smooth ride through any blackout without a hitch. if you added a headline to possibly get a person’s attention? I mean Do You Need a Home Backup Generator, and Which One Is Best? You are right! I will see what i can do!